While small, local florists often try to keep a few exotic or local flowers on hand, online mega-florists focus on supplying the most popular flower types. This is fantastic for people shopping with a specific type of bloom in mind; many online retailers offer the option to sort bouquets by the dominant flower. Some sites even offer the option of adding or substituting popular flowers if you do not see the exact bouquet you want. The following article contains brief descriptions of popular flowers commonly ordered online as well as ideas of who the flower might suit. Unlike roses, tulips have no automatic romantic connotation, which makes them excellent all-purpose, casual, platonic bouquet flowers. 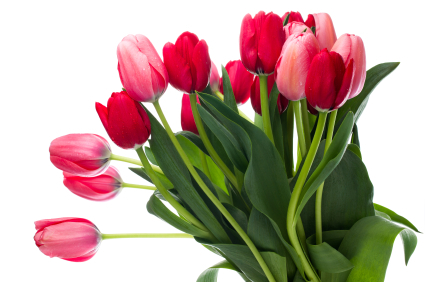 A tulip bouquet is a great "get well soon" bouquet, co-worker or boss appreciation present, or gift for a friend. 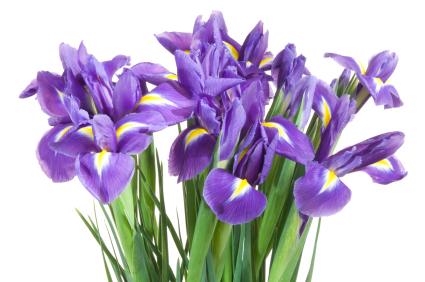 Irises are beautiful purple-blue flowers with yellow accents towards the center of the bloom. They were a favorite flower of Impressionist painters due to their regal colors. Irises produce a dignified, refined bouquet that would make a great present for non-romantic interests when paired with other non-romantic flowers (such as daffodils or daisies). Irises are suited for get well bouquets, teacher appreciation gifts, Mother's Day bouquets, and courtesy bouquets when visiting for a dinner party. Irises are more fancy than tulips, and on par with lilies for formality. However, adding red, yellow, or white roses would make a beautiful and unusual bouquet for a love interest who enjoys the deep purples and blues of irises. Adding a card explaining that you chose irises because of your significant other's love for the color will add to the romantic appeal. There are many types of lilies, but most are characterized by having one row of large, elongated petals or, in the case of the Calla lily, one large petal which wraps around the flower's stamen. Colored lilies, such as Asiatic or Day lilies, make a beautiful platonic bouquet. They would make beautiful get well or appreciation bouquets. 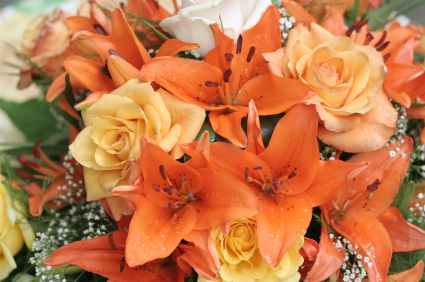 Due to their dramatic orange coloration, Tiger lilies would also make excellent "cheer up" bouquets, get well bouquets, or bouquets to take to a theater performance for a younger actor or actress. Roses are the flower most often associated with romance and love, at least in Western cultures. Roses, and especially red roses, are a customary gift for a romantic interest. In the event that you need an "I'm Sorry" bouquet, a bouquet of a dozen long-stemmed red roses is probably the best and safest bet. However, roses can be an expression of platonic or non-romantic love as well. Pink or orange roses would make a lovely gift for Mother's Day or for a very appreciated co-worker (such as an administrative assistant). White is often associated with religious ceremonies, so white roses would be an acceptable gift for a First Communion or religious rite of passage.